The lucky rabbit foot necklaces come in natural or assorted dyed colors and hang on a 32" leather strap with a glass crow bead. The rabbit foot is 2.5": to 3" long and 1" wide. Each necklace weighs about 0.4 oz or 12 grams. Please see our dyed rabbit foot keychains page for pictures of the dyed colors available. For a complete listing of our Trading Post Necklaces, click HERE. These necklaces are NOT Native-made. Click HERE for Native-made jewelry. 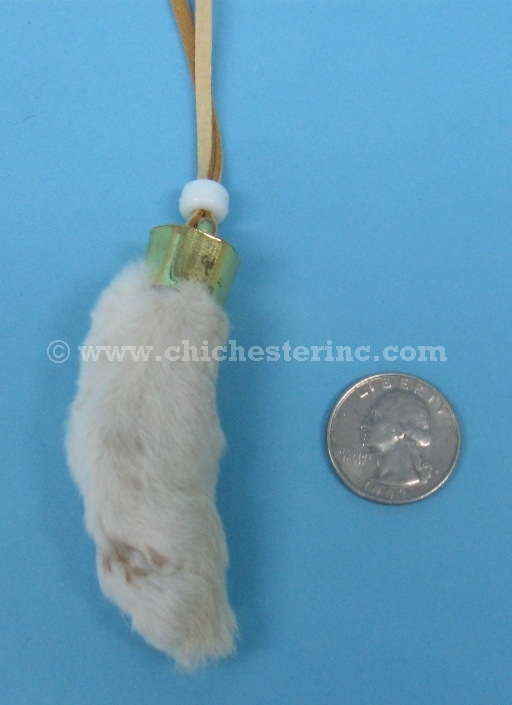 For Rabbit Foot Keychains, click HERE.